Today's giveaway is a new book by a new author. Magdalena Zenaida has written a lovely, bilingual, picture book for children introducing them to the famous Cuban poet, José Martí. Centered around one of Martí's first books of poetry, Versos sencillos, this book talks about his life as a young man and touches on a few of the events that influenced his writing, as well as the many places he lived while exiled from Cuba. Don't let the title fool you. (It was the first thing I noticed, too.) I don't believe it is meant to be a literal translation as we typically see in most bilingual titles. The book is written in English, with some of the Spanish verses from the poem scattered throughout the text. And at the back is an excerpt from Versos sencillos along with a translation that is again, not a literal one, but rather one that conveys the meaning within his poem perfectly. In addition, Zenaida has included a couple of pages with a more informative biography of Martí's life in the back of the book that includes more details about his role and influence in Cuba's revolution for independence. You'll also learn more about his works, including Abdala, La Patria Libre, Ismaelillo, and La Edad de Oro. This is the first picture book I've seen about José Martí, and Argentinian Gastón Hauviller's illustrations are sweet and engaging. 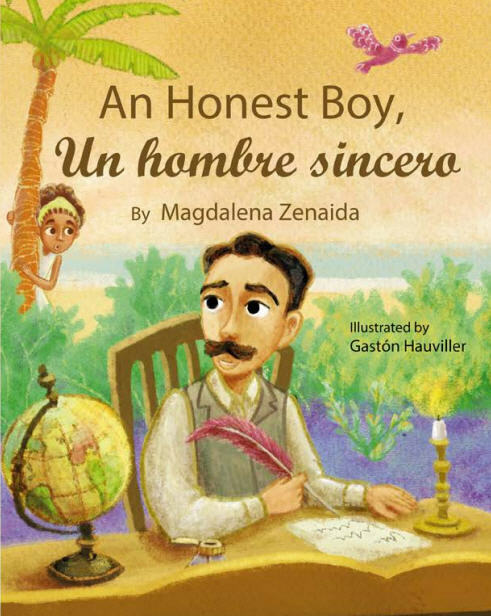 I'm glad to finally see Martí as the subject of a children's book. It's available in paperback and best suited for kids ages 4 to 8. THREE MommyMaestra readers will win a signed copy graciously donated by the author. You really do know quality MM! I am so inspired by your work! Learning through literature is my favorite thing! Would love to win this to add to our kids lit collection. :) Thanks for hosting all of these great giveaways! Acabo de terminar una clase de literatura y leí la poesía de José Martí. Thanks for chance to win this neat book! Really excited about this book! It will be an excellent addition to our book collection. Gracias for hosting the give away! Me encanta que mi nina aprenda acerca de mis autores favorites a traves de estas pequenas biografias. Muchas gracias! This book looks wonderful. we greatly enjoy poetry in our home, and how lovely to have a chance to learn about such a significant poet. Our bilingual family would love to have this book in our collection. We are avid readers! What a fun book to read to my budding Elementary poets! LOVE! It would be great for my girls to learn more about poetry and their Hispanic history! I know not to judge a book by its cover, but this one looks so good! Can't wait to get my hands on it. I love authentic Spanish texts (I know it's a bilingual book, but the Spanish authenticity is still there)! Would love to have it in my classroom. Fingers crossed! Always looking for Spanish books to add to our collection.